Beathard and Nick Mullens will start the offseason program on even ground in a competition for the No. 2 quarterback job, Matt Maiocco of NBC Sports Bay Area reports. "We'll rotate C.J. [Beathard] and Nick [Mullens] with the twos," coach Kyle Shanahan said Tuesday. "[We'll] flip a coin the first day." Beathard started five games for the 49ers this season, finishing with 1,252 passing yards, eight touchdowns and seven interceptions while completing 60 percent of his passes. Beathard will remain the 49ers' backup quarterback for the team's Week 13 game with the Seahawks after coach Kyle Shanahan announced Monday that Nick Mullens would retain the starting role, Curtis Pashelka of The San Jose Mercury News reports. Beathard may get another chance to start for the 49ers at some point in December, Eric Branch of the San Francisco Chronicle reports. Nick Mullens confirmed that he would continue to serve as the 49ers' starting quarterback Week 10 against the Giants, relegating Beathard to the No. 2 role, Matt Barrows of The Athletic reports. Beathard is expected to remain the 49ers' backup quarterback in Week 10 against the Giants with Nick Mullens on track to earn another start, Jay Glazer reported on "Fox NFL Sunday." Coach Kyle Shanahan hasn't announced his plans at quarterback for the 49ers' Week 10 matchup with the Giants, but Beathard seems unlikely to receive the starting nod over Nick Mullens after the latter's stellar outing in Thursday's 34-3 win over the Raiders, Eric Branch of the San Francisco Chronicle reports. Beathard (wrist/thumb) is active for Thursday's game against the Raiders. However, he'll serve as the backup quarterback to fill-in starter Nick Mullens, Adam Schefter of ESPN reports. Analysis: In the wake of a Week 8 loss at Arizona, Beathard suffered from a lacking grip due to wrist and thumb injuries to his right hand. The development opened the door for 2017 undrafted free agent Nick Mullens to take his first NFL snap. That said, the 49ers released journeyman QB Tom Savage on Thursday, which leaves Beathard as the only other signal-caller on the gameday roster. Beathard (wrist/thumb) is expected to serve as the backup quarterback to Nick Mullens on Thursday against the Raiders, Adam Schefter of ESPN reports. Analysis: Beathard will take a brief step down on the 49ers depth chart due to his inability to grip a football at the moment. While he won't start the game under center, he'll be the only other QB on the 46-man gameday roster after the 49ers released Tom Savage on Thursday afternoon, meaning Beathard could still make an appearance. Beathard (wrist/thumb), who is listed as questionable for Thursday's game against the Raiders, is considered "truly 50-50" for the contest, a source told Adam Schefter of ESPN. Beathard (wrist) participated in Wednesday's walk-through practice and is listed as questionable for Thursday's game against the Raiders, Matt Barrows of The Athletic reports. Beathard acknowledged Wednesday that his right wrist and thumb "are kind of messed up," casting some doubt on his availability for Thursday's game against the Raiders, Cam Inman of The San Jose Mercury News reports. Coach Kyle Shanahan said Tuesday that Beathard (wrist) is struggling to hold a football, which is threatening his availability for Thursday's game against the Raiders, Cam Inman of The San Jose Mercury News reports. Analysis: Beathard emerged from Sunday's loss at Arizona with a wrist injury. A decision on Beathard likely will come down to the wire, per Shanahan, but the quarterback is missing back-to-back practices to kick off Week 9 prep, according to Inman. Nick Mullens is the next man up at quarterback in San Francisco. Beathard (wrist) was listed as a non-participant on the 49ers' estimated injury report Monday, Matt Maiocco of NBC Sports Bay Area reports. Beathard completed 14 of 28 pass attempts for 190 yards and one touchdown during Sunday's 18-15 loss to the Cardinals. He also carried five times for nine yards. Analysis: Beathard struggled to connect with his receivers at times as he completed just 50 percent of his pass attempts on the day. His lone touchdown came on a 55-yard catch and run by Marquise Goodwin, which accounted for a large chunk of his overall output. Beathard did avoid turning the ball over after doing so 10 times in his previous four games, but finding significant positives here proves difficult He'll look to step up his productivity Thursday against the Raiders. Beathard completed 15 of 27 pass attempts for 170 yards, one touchdown and two interceptions during Sunday's 39-10 loss to the Rams. He also carried two times for 13 yards and lost a fumble. Analysis: Beathard completed just over half the passes he attempted while recording a season low in yardage. His turnovers prevented his team from ever climbing back in the game, including one just before halftime and another in the third quarter that set up a Rams touchdown. Beathard has been a turnover machine since assuming the starting job, throwing seven interceptions to go along with three fumbles in four games. He'll look to improve that aspect of his game next Sunday against the Cardinals. Beathard completed 16 of 23 passes for 245 yards, two touchdowns and an interception in Monday night's 33-30 loss to the Packers. Analysis: Beathard enjoyed a great start at Lambeau Field, tossing two touchdowns from 30-plus yards. 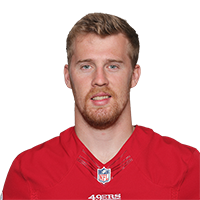 With Jimmy Garoppolo (knee) injured, Beathard figures to lead the 49ers for the remainder of this season, and has now thrown for two touchdowns in three straight games. While his five interceptions over that same span are cause for concern, Beathard has proven a decent fill-in option for San Francisco while its franchise signal-caller is sidelined. Beathard completed 34 of 54 passes for 349 yards, with two touchdowns and a pair of interceptions in Sunday's 28-18 loss to Arizona. He also scored a touchdown on the ground, lost two fumbles and was sacked four times. Analysis: It was truly a mixed bag for Beathard, as he accounted for three touchdowns and four turnovers. His fourth-quarter fumble was returned for a touchdown, essentially ending any hopes the 49ers had at a comeback. Dating back to last year, Beathard's career TD:INT ratio is an ugly 8:10, but at least he's producing from a fantasy perspective. He'll look to put up big numbers again in Week 6 at Green Bay. Beathard completed 23 of 37 pass attempts for 298 yards, two touchdowns, and two interceptions in Sunday's 29-27 loss to the Chargers. He added 19 yards on seven carries. Head coach Kyle Shanahan affirmed that "C.J. 's our guy" following the announcement that Jimmy Garoppolo (knee) will undergo season-ending surgery, Matt Maiocco of NBC Sports Bay Area reports. Head coach Kyle Shanahan expressed confidence in Beathard as his potential starting quarterback moving forward in the wake of the potential season-ending knee injury suffered Sunday by Jimmy Garoppolo, Nick Wagoner of ESPN.com reports. Beathard will start Thursday's preseason game against the Chargers, Tom Pelissero of NFL.com reports. Analysis: Jimmy Garoppolo will wear street clothes during the exhibition finale. Beathard is the clear-cut No. 2 QB in San Francisco, and he'll mostly play against and with depth players Thursday. The 23-year-old is still a project for the Niners after he played seven games last year, completing 55 percent of his passes for 1,430 yards, four touchdowns and six interceptions. Beathard (foot) completed seven of eight pass attempts for 78 yards in Saturday's preseason tilt against the Colts. Analysis: Beathard suffered a foot sprain in the 49ers' second preseason game, but his presence in Saturday's contest confirms his good health heading into the regular season. The 23-year-old is a lock to serve as Jimmy Garoppolo's backup this year. With the latter not expected to play in Thursday's preseason finale, Beathard could get some decent run in the club's final tune up against the Chargers. Beathard (foot) didn't practice Tuesday and is considered day-to-day, David Lombardi of The Athletic Bay Area reports. Analysis: Beathard sprained his foot during last week's preseason game against the Texans and hasn't practiced since, but it doesn't appear too serious. QB Jimmy Garoppolo is on track to play the first half of Saturday's exhibition contest against the Colts, but Beathard could be called upon if healthy. If Beathard can't go, expect Nick Mullens to log extra snaps. Beathard suffered a foot sprain in Saturday's preseason tilt against the Texans and will be evaluated further Monday, ESPN's Nick Wagoner reports. Analysis: There were no reports of an injury after Beathard completed 10 of 17 passes for 82 yards in relief of Jimmy Garoppolo, so the foot injury must have flared up after he left the contest. The 49ers will run tests on the backup quarterback's foot Monday, and Nick Mullens figures to move up the depth chart if Beathard is unable to go next week against the Colts. Beathard is secure in his role as the No. 2 quarterback, Matt Maiocco of NBC Sports Bay Area reports. Analysis: A third-round pick last year, Beathard completed just 54.9 percent of his passes while throwing more interceptions (six) than touchdowns (four), but he did lead the Niners to a Week 10 win over the Giants and partially atoned for the lack of passing production by taking 26 carries for 136 yards and three scores. There's no real competition for the backup job behind Jimmy Garoppolo. Beathard completed 55 percent of his passes for 1430 yards and four touchdowns to six interceptions in six starts this season. Beathard will remain in a reserve role this Sunday against the Texans after head coach Kyle Shanahan named Jimmy Garoppolo the starting quarterback on Monday, ESPN's Nick Wagoner reports. Beathard (knee/hip) doesn't have a designation on the 49ers' final injury report for Sunday's game against the Bears. Analysis: As expected, Beathard is healthy enough to serve as Jimmy Garoppolo's backup. Barring an injury or a completely disastrous performance by Garoppolo, the rookie likely will play out the rest of the season in a backup role. Beathard (knee/hip) was limited in practice Thursday, Nick Wagoner of ESPN.com reports. Analysis: A mere spectator Wednesday, Beathard was present during the portion of Thursday's session open to the media, per Cam Inman of The San Jose Mercury News. Beathard must participate both Thursday and Friday in order to serve as Jimmy Garoppolo's backup Sunday in Chicago. As a result, Friday's injury report will provide the final word on Beathard's Week 13 availability. In the event Beathard doesn't get the all-clear, the 49ers can elevate undrafted rookie Nick Mullens from the practice squad. Beathard (knee, hip) didn't practice Wednesday, but he's expected to take part Thursday and Friday as he prepares to serve as Jimmy Garoppolo's backup for Sunday's game in Chicago, Matt Maiocco of NBC Sports Bay Area reports. Analysis: Beathard is recovering from a knee contusion and a hip strain, both of which are considered minor injuries. It's unclear to what extent those ailments played a role in the decision to make Garoppolo the starter, but there's at least some chance the 49ers will evaluate their quarterback situation on a week-to-week basis the rest of the year. It thus won't come as any surprise if Beathard gets another opportunity, though he'll only be available in a backup capacity this weekend. Beathard (knee/hip) will be relegated to a reserve role Sunday in Chicago after head coach Kyle Shanahan named Jimmy Garoppolo the starting quarterback for the contest. Beathard sustained a bruised knee and strained hip during Sunday's 24-13 loss to the Seahawks, Cam Inman of The San Jose Mercury News reports. "It was good news, nothing serious or long-term," head coach Kyle Shanahan said Monday. "We'll look into it more tomorrow." Beathard (leg) doesn't think he tore any ligaments, saying his injury could just be a bone bruise, Cam Inman of The San Jose Mercury News reports. 49ers coach Kyle Shanahan acknowledged that Beathard may have suffered a serious leg injury in Sunday's 24-13 loss to the Seahawks, Cam Inman of The San Jose Mercury News reports. "I've got a lot of respect for how [Beathard] plays," said Shanahan. "He gets better each week and hopefully (the injury) is not as bad as it looked"
Beathard completed 22 of 38 yards for 201 yards and an interception during Sunday's 24-13 loss to Seattle. He added 21 yards rushing on six carries. Analysis: The biggest sequence of the game for Beathard came in the closing moments of Sunday's action where Beathard was taken out after a tough hit. Trade-acquisition Jimmy Garoppolo promptly threw a touchdown in relief. The 49ers staff has been slow to go with Garoppolo since trading a second-round pick to New England and Beathard was coming off a three-touchdown game against the Giants, but this will be Garoppolo's team sooner or later. Depending on Beathard's health, the time frame might creep up. Beathard (thumb) wasn't listed on the 49ers' injury report Wednesday, Matt Barrows of The Sacramento Bee reports. Analysis: Beathard has benefited from the 49ers' Week 11 bye, taking every first-team practice rep Wednesday over Jimmy Garoppolo. With his thumb injury a thing of the past, Beathard will continue to serve as the starting quarterback Sunday against the Seahawks and beyond. Beathard (thumb) will start Sunday's game against the Seahawks, Eric Branch of the San Francisco Chronicle reports. Analysis: San Francisco general manager John Lynch spoke in support Beathard on Tuesday, and head coach Kyle Shanahan confirmed Wednesday that the rookie will receive at least one more start. Beathard will face a Seahawks defense that actually looks a bit vulnerable sans Richard Sherman (Achilles) and Kam Chancellor (neck). Even so, the 49ers are still expected to take a look at Jimmy Garoppolo for at least one or two games before the end of the season. The 49ers haven't decided on a starting quarterback for Sunday's game against the Seahawks, but general manager John Lynch seemingly vouched his support for Beathard (thumb) on Tuesday, Cam Inman of The San Jose Mercury News reports. "You watch the way C.J. Beathard played the other day, he looked like he could be the guy. That's a good issue," Lynch added. Head coach Kyle Shanahan said Beathard, who injured his right thumb during Sunday's victory over the Giants, underwent further testing that did not reveal any fractures, Nick Wagoner of ESPN reports. Analysis: Beathard doesn't seem to be dealing with a significant injury and has over a week off to rest thanks to the 49ers' Week 11 bye. However, Shanahan was non-committal on naming his starting quarterback for the Week 12 game against the Seahawks, which suggests there's legitimate uncertainty surrounding Beathard's impending availability. If the rookie ultimately doesn't recover in time, Jimmy Garoppolo would likely take over under center. Beathard completed 19 of 25 pass attempts for 288 yards, two touchdowns and one interception Sunday against the Giants. He also carried five times for 15 yards and a touchdown in the 31-21 win. Head coach Kyle Shanahan confirmed Friday that Beathard will start Sunday's contest against the Giants, Nick Wagoner of ESPN.com reports. Analysis: Beathard will fend off Jimmy Garoppolo for another week, but at some point the 49ers will see what they have with their new signal caller. In the meantime, though, Beathard will focus on a Giants defense that has conceded at least three touchdown passes in four of the last five games. Head coach Kyle Shanahan expects Beathard to start Sunday's game against the Giants, Eric Branch of the San Francisco Chronicle reports. Analysis: The 49ers acquired Jimmy Garappolo from the Patriots last week, setting in motion a changing of the guard at quarterback. Shanahan appears to be playing it safe until Garappolo has a better understanding of the offense, but he also would like to see the new signal caller take the field "hopefully sooner than later." Until Shanahan decides to pull the plug on Beathard, the rookie will prepare for the Giants, who have given up the fourth-most passing yards per game (265.3) this season. Beathard completed 24 of 51 passes for 294 yards and one interception during Sunday's 20-10 loss to the Cardinals. He added 16 rushing yards and a touchdown on three carries.